I had a fantastic day of painting yesterday. My sister came over and read to me, and the kids took an awesome nap while I painted. This painting I just had to post eventhough it is not even dry yet. I will have to take better pictures of it at a later date but, I just had to put it up here. 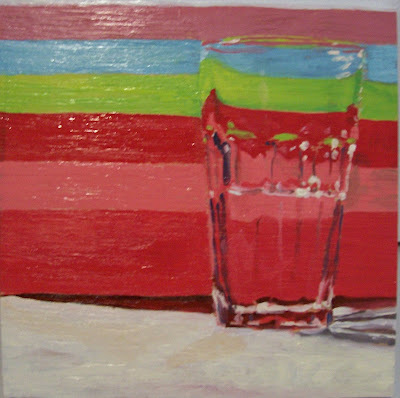 I was inspired by this gift bag I had received and I loved how the colorful stripes shattered a bit when I placed my glass of water in front of it. Finding beauty in everyday life, at it's finest! Love, Love, Love the colors! The glass looks like you could pick it up right off the canvas.